Carlton centurion Rory McCann wants the younger players in the side to take the confidence gained from Saturday’s CSL Eastern Premier Division win over Watsonians into the rest of May and beyond. Former Irish international McCann’s 123 not out held Carlton’s innings together at Grange Loan and helped them to post 253-5 from their 50 overs. George Munsey then continued his amazing start to the season in all formats with 101 for Watsonians, but his team mates could not back him up and the visitors were all out for 181. Carlton will be well served by experienced figures like skipper Ali Evans, vice-captain Arun Pillai, Fraser Boyd and Omar Ahmad this summer as always, but 33-year-old McCann wants the less experienced players to really take games by the scruff of the neck. Shiv Gupta did just that at the weekend, the Edinburgh University student taking five wickets on his league debut. And in 18-year-old Gupta, Kyle and Ruari Macpherson, Tom Simpson, Ali Shah and others coming through, McCann is excited to see what the young players can do in the next few games. “With the likes of Fraser Watts retiring last season and myself and others who have been around the team not going to be available for every game, it really does give a crop of young players the chance to show what they can do,” McCann said. “Despite being in their teens or early 20s a few of them have quite a bit of cricket with the first XI and second team already under their belts and they are starting to put into practice the things they have learnt. On the 72 run win over Watsonians in a repeat of last year’s Scottish Cup final triumph, McCann added: “Early on runs were quite hard to come by so you had to work for them, but I managed to dig in and put together some handy partnerships. Heriot’s and Mazars Grange both made it two wins from two in the league. At Inverleith against Stewart’s Melville, Heriot’s batted first and were indebted to a battling 51 from Ryan Brown to help them up to 214-9. Tom Hilton too five wickets for the home side. Once again Stewart’s Melville failed to deliver with the bat though, being bowled all out for 119. At Forthill, 64 from Ryan Flannigan helped Grange to make 250-7 batting first against Forfarshire. 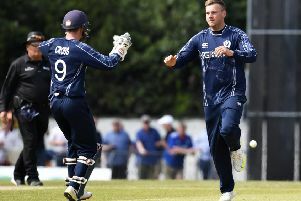 Scotland player Craig Wallace hit an unbeaten century in reply for the home side, but five wickets from Gordon Goudie saw Grange home by 23 runs. RH Corstorphine are celebrating after their first win in the top flight since promotion. They hosted Glenrothes at East Barnton Aveue and batting first the Capital men managed to get up to 256-7 from their 50 overs. That score was built on a superb 92 from Elliot Foster while Majid Haq and skipper Joe Kinghorn-Gray both weighed in with 37 apiece. William Blease got the key wickets of Ben Wilkinson and Safyaan Sharif in Glenrothes’ reply and then Haq came to the party. The spinner took superb figures of 5-21 to rip through the visitors’ middle and lower order. In the end Glenrothes were 128 all out, RH Corstorphine securing victory by 128 runs to give them a big boost.